The grand opening of a new branch of 7Eleven Cinema in Osogbo will be held on Monday, January 1, 2018. 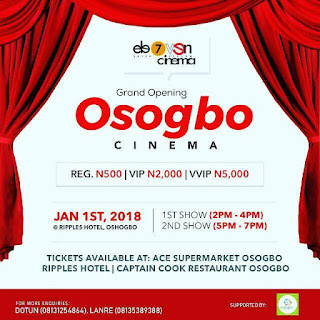 A release issued by the management of 7Eleven Cinema, a copy of which was made available to Amiloaded, disclosed that the grand opening event would hold at Ripples Hotel, off Ring Road, Lameco area in Osogbo. It reads, "You asked for it, we took note of your complaints and now we have brought the Cinema home. No more boring weekends where you will be sitting idly at home or park. No more traveling long distance to see a movie as we are here to make your weekends and holidays worth the while. "So, come one, come all. Our choice of movies takes into consideration the needs of families with kids, teens and couples. We hope to blow your minds with the best and latest movies as they are being released to Cinemas. "Red carpet (CrossTV) is at 1pm. "Proudly supported by Ace Supermarket, Captain Cook, Nice Computers, Ripples hotel, OneForAll Initiative, Lautech Mouthpiece, You and I, & Checkers supermarket."